A recent 6-week intergenerational project on the farm, funded by the Young Camden Foundation, has led to some wonderful intergenerational interactions, as well as some fabulous home crafted dinnerware! At each session of Pottery Partners, Pedro, Kentish Town City Farm’s community potter, introduced new techniques, which would inspire new topics of conversation. By the end of the workshops, children and older people were working on painting pottery together with no prompting, which was fantastic to see. By learning new skills together, these pottery workshops provided a calm and collaborative environment for people to get to know one another. Painting invoked lots of memories for the participants, with many painting dinnerware for loved ones, and the joy of creating something you can use provided obvious points for celebrating each other. After each pottery workshop, a hot meal cooked by young volunteers and KTCF Supper Club cook, Trisha, was brought to the sheltered housing for everyone to enjoy a meal together. This provided a wonderful end to each session. This project is part of Kentish Town City Farm’s ongoing work with older people. Next up at the Farm is a musical concert by Songhaven with an afternoon of songs, singalongs and tea on Tues, 27 Feb, 2 – 3:30pm. See What’s On for full details. 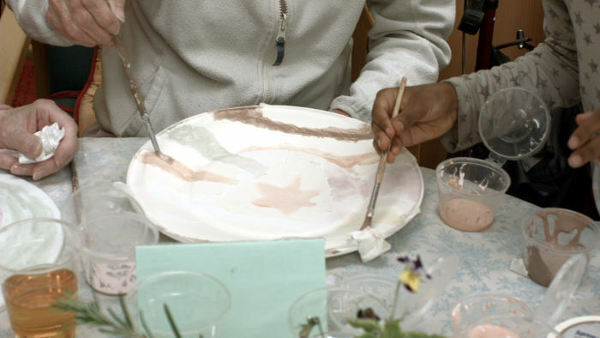 Pottery Partners is a collaborative project between KTCF and the Young Camden Foundation, bringing together young people from the farm’s pottery and cooking groups and Cressfield Close Sheltered Housing. Jo Hynes is Project Co-ordinator at Our Three Points, which co-ordinates activities and projects between Kentish Town City Farm, Castlehaven Community Association & Queen’s Crescent Community Association for people aged 60 + in the Gospel Oak & Haverstock areas of London. Get in contact with Jo on 07419820503 or abc@ktcityfarm.org.uk or check out www.ourthreepoints.co.uk for details of upcoming activities.